The area around the town, situated on a hill near the centre of the island, has been settled since Neolithic times. Victoria is the name given on 10th June 1887 by the British government on the occasion of Queen Victoria's Golden Jubilee, at the request of the Bishop of Malta, Mons. Sir Pietro Pace. However, many Gozitans  and mainly old Gozitans, still often refer to it by the name Rabat. It is usually known as Ir-Rabat Ghawdex to distinguish it from the town of Rabat on the main island of Malta. 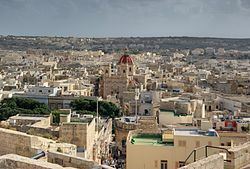 This article uses material from the Wikipedia article "Victoria, Gozo", which is released under the Creative Commons Attribution-Share-Alike 3.0 License.